February 27th is the Global Day of Action to Occupy Our Food Supply. Occupy Big Food is very concerned about the failure by corporations and our government to label our foods properly. 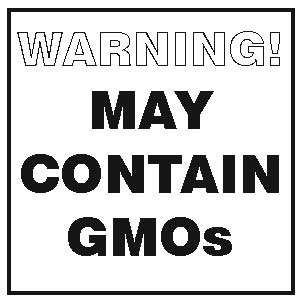 As it stands now, food corporations are not required to label foods that contain ingredients that come from GMO crops. This is largely due to the fact that corporations know warning labels on foods might turn customers off, or will at least spark questions in their minds — questions like, what’s a GMO? Should I be eating it? We believe our government should require GMO foods to have mandatory labels so that consumers can begin to make more informed decisions about what they’re putting into their bodies. Until then, what can we do? Let us know what you think in the comments. 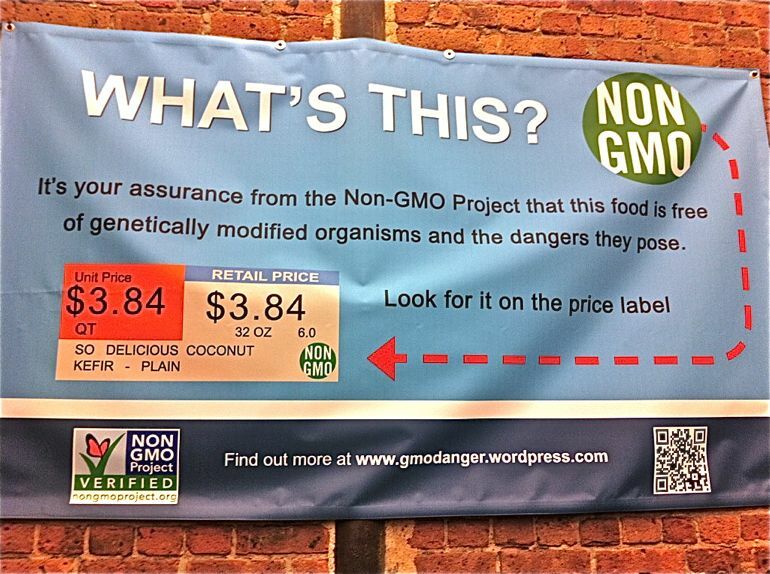 Our food coop in NYC (the largest food coop in the country), with the help of the Non-Gmo Project, is taking another approach and is now requiring that foods be labeled “Non GMO” when free of GMO crops. Grocery stores across the nation could better serve their consumers and communities by doing the same. We as consumers have a right to know. #F27 is only the beginning, spread the word. What are you doing to Occupy Our Food Supply on F27? Let us know! It is important to slow down and think about food as nourishment rather than just something to gulp down in between meetings or on the way to pick up the kids. Rather than worry about following a fad diet, think about your health and your lifestyle instead. Start by learning which foods are good for you. I agree, I was pouring my son some oatmeal and thought…these oats are extremly large…so i looked up whether quaker is GM and they are.. Im throwing away the oatmeal and never buying it again. Buy organic rolled oats instead. USDA Organic banned GMO. Warning this food will poison your family . We should have the choice to choose healthy natural food over poisoned food. Why has this right been stolen from us. I choose non gmo, non poisoned, and non hormon antibiotic fed dairy/meet. I want to live!!!!! Warning! Everything listed as food in this article is over-processed anti-nutrient non-food. I’m on the same page as Ashley and choose actual food, meaning fresh produce and meats that haven’t been compromised by chemicals and over processing. Quaker Oats, old fashioned oatmeal (which is “rolled” oats and nothing else) has GMO Oats? Where did you get this information from? All the research I’ve done suggests that oats are not GMO, but corn is, and so is sugar (from sugar beets). There are no versions of GMO oats or wheat currently produced in the United States. Oats may not be genetically modified, but they are process at the same facility with the GMO products Quaker makes, so in essence, they have been contaminated. GMO wheat has been tested on several farms. A farmer sued Monsanto because his crops became contaminated with GMO wheat and caused export orders to be canceled because of the contaminated wheat. I haven’t heard whether or not the issue has been resolved or whether the wheat had been destroyed or what. Quaker products should be avoided because we do not want to support any company who uses GMOs at all in any product. However, if you look closely, you’ll see that it says “A commercial use of GM oats is not to be expected in the long run.” As well, the GM oat was a single field trial conducted in the U.S. in 1998. To claim that oat is “GMOed” from one trial is misleading. If that’s what it took for a species to be “GMOed”, then an exceedingly large number of species would have to be called such due to their alteration is various scientific studies. To Perry Way. I am not educated on how oats are produced or if there is a link, but any of the packet oatmeals contain dextrose(corn sugar). Genetically modified corn producing dextrose. A GM food in the US of the corn variety is largly Monsanto owned. I wonder what our muslim brothers think of the way Monsanto has been treating the world with their GMO products. The western world seems so helpless in dealing with this monster in their own backyard. Ironically, Monsanto is headquartered in Missouri, the SHOW ME state. Has anyone ever SHOWN US that GMO’s are safe? Were they ever actually tested? Did anyone wonder what might happen if we started playing GOD with our food supply? This sickens me in more ways than one. Never mind separation of church and state. We might could do with more GOD in our government… how about separation of CORPORATIONS and STATE??? Monsanto is in bed (and vice versa) with more politicians than a streetcorner crack whore! Is this really the future and legacy they want to build for their children? Are we tweaking nature to create our own demise. I bet these GMO crops will be around long after man has come and gone… then who will they serve? Shame, shame, shame on the FEDS/AGRI-CORPS (AGRI-WHORES) for messing with Mother Nature. Some things should be sacred and clearly making a buck still comes first in this country. Irony #2: WE ARE BROKE! Live well, love deeply, laugh often. Buy Organic and pray for someone near the top to WAKE UP! More than one-third of U.S. adults are obese. Most processed and packaged foods contain GMOs, estimate is 70 percent..40 percent of food in the United States today goes uneaten. Why not buy Quality instead of Quantity??? It can be a little bit more pricier but I bet we won’t be wasting food if we paid more..or let’s just say in health wise, I rather pay now than later! Have you researched GMO??? Did you know that once that particular plant has lived out its lifespan you can no longer plant/regrow another crop from that seed?? That is not evolution its stupidity and another way to make money off of people who are uneducated. Killing the world’s natural resources is not evolution it’s destroying our planet. You know what they’re doing happens naturally. This is called evolution, but we are taking a spin on it and increasing its rate of occurrence. I think most of you are stupid for believing such myths as poisoned GM foods. There have only been a few noted cases of true human ‘poisoning’ in GM crops. In this case it was a grain crop that was tested then found that it contained a allergen that less than a percent of humans were allergic too(kind of like peanuts), this crop was then labeled as livestock only. Some idiots decided to sell it as a commercial product though (i believe it was used to make tortillas in the late 90’s) . GM foods are strictly tested for harmful allergens. Compared to the lives GM foods have saved in the U.S, India, China, and other parts of the world. this so called poison they put into plants is completely false. When you look at anything from Genetic Engineering, hundreds of millions of people, if not billions, would be dead without it. I say instead of looking at something such as this as a dis-owned stepchild, embrace it for the lives it has saved. Please read some official studies before you post your opinion. Oh yeah, when GM puts a Plasmid into a plant such as corn, to produce a GM crop, which then produces a pesticide (which is harmless to humans and most life besides the pests), which makes it so our oil starved economy doesn’t have to use millions of barrels of oil to supply the machines to dust our crops. Most GM crops come from commodity farmers, such as corn, soybean, cotton, and canola seed, but without a vast supply of these crops we would have shortages of most items we use on a regular basis. Also to reduce obesity rates (a response to a previous comment) change the BMI chart or stop eating so much. It is not the GM products fault or U.S industry, it is only your own for being fat and lazy. BMI chart states that i am 23.5% fat, nearly overweight. Ahhh yes, GMO foods have fed the “starving” in countries where grain does not grow,, but did you ever think maybe things do not grow in certain places because they are not meant to? As for the “shortage” here, have you any idea how much food is wasted daily by the American people alone? The tons of waste that don’t make it to shelters or food banks is offensive. How about the excess of soy and sugars used in EVERYTHING? Do we really need HFCS? That did not come about until the 1970’s. As said in Jurassic Park: If there is one thing the history of evolution has taught us it’s that life will not be contained. Life breaks free, it expands to new territories and crashes through barriers, painfully, maybe even dangerously, but, uh… well, there it is. You shouldn’t mess with nature, EVER. @ Pickof Destiny I agree with you , do not mess with nature. you should do a little research and investigate just gmo’s have actually done in india to cotton farmers that are many generations old. do a little research on you tube and watch a few of the videos with actual scientists and experts that have lost thier jobs for speaking out about the dangers of gmo’s. it is not what nature does at all or nature would be doing it. nature does not protect a plant from a pesticide meant to kill everything. nature does not make plants that produce insecticide to kill all insects. see what its doing to small farmers in the US or third world countries. you probably believe wal mart and china are good too?? produces a pesticide (which is harmless to humans and most life besides the pests), WOW you really do not have a clue. Round Up is what you are talking about. Here is on quick article I pulled up out of thousands of articles about the horrors of roundup by Monsanto. Ecological Applications, the new study reveals once again the incredible hormone-altering power of Roundup, and how even minute exposure to this highly-toxic chemical brew can have disastrous health consequences. Is nescafe coffee original gmo free or not? Scary stuffs. This is why I love my summer garden. All heirloom seeds. Don’t forget that Monsanto is the producer of Roundup Ultra, the lethal poison sprayed on Colombian fields, supposedly to kill coca fields, in fact, however, to kill farmers’ harvest and drive them off the lands. I’ve seen children who had to go to hospital every day to receive oxygen, because they live near where the fields are being sprayed. Thank you for posting this. I had no idea. Since you’re educating yourself about GMO, which is great, while you’re at it you should research about vaccines too. Vaccines are design to keep people sick, and the driving force is money $$$… before you answer my statement in your mind (defend your decision to vaccinate your son), ask yourself if the companies that produce vaccines, like big $ corps like monsanto, have your sons health in their best interest. My son has moderate to severe autism and it is sad that this country is willing to use whatever they see fit to produce more food that is often thrown away in this country and yet we have starving children right here in our country……none of this makes a lot of sense to me…….I have great issues with the chemicals we use in many man made foods like TBHQ and much more! I am still learning about GMO and I have to say that with my sons Autism he was the first discovery in the entire world through his genetic testing to have two copies of what they believe is the Autism Gene……and then they did testing on me and they cant explain why he is this way?! I have always wondered about links with genetically altered food and my sons autism and also my son genetically could not handle the vaccines and became very ill and more autism symptoms appeared immediately after every session of vaccines……….I am just feeling that this country’s quest to save money and to improve health in some areas and risk health in other areas has gotten out of control…….food should be prepared in a natural state and expire at a natural rate and we shouldn’t be trying to kill every single bug ect. with poison and killing our lifesaving bugs in the process such as bees that are needed for pollination……….I am sick of all the so called progress and not being able to trust our food…….I have developed many allergies to foods and so has my son and I don’t think it is just a coincidence……..love science and progress……some things need to be left alone such as our food. WHY is Monsanto not prosecuted ? They are nothing short of murderers ! How is this allowed ..why are they above the law ? It makes me sick ..literally . So the company that is responsible for the DEADLIEST chemicals ever made are taking over our food supply???? Um, I don’t understand how anyone could find this acceptable. A special place in hell would be too good for the people responsible for that company. NO GMOs – Simpler Food Labels – Both are reasons why Simply Eight is challenging the status quo of the processed foods industry. We believe great tasting convenient breakfast and snack foods can be made … simpler – without all the complicated inventions of modern food science. Our foods are made with all-natural ingredients (NO GMOs) you can commonly find in your pantry. And they taste great! Ingredient lists for today’s processed foods have become complex — both in length and pronunciation. Furthermore, a single listed ingredient could have many more sub-ingredients within it. Many of these complex ingredients on processed food labels are hard to pronounce and even harder to identify. Our website: http://www.simplyeight.com. Follow us on Facebook. Our products can be purchased on Amazon.com http://www.amazon.com/shops/simplyeight. Thank you for existing. I’m trying to ban GMO food out of my life, I realize I have to do my homework. I’m going organic and I’m going to farms, calling distributors who claim to be non GMO to fact check. Please share whatever info you have on safe brands. thanks. I, myself, just recently became educated about GMO’s. In doing some research, I came across an article published in 2007 warning about the dangers of GMO’s. I literally got sick to my stomach thinking about all the foods I had eaten over the past 6 years where the primary ingredient was a GMO. All I have to say is, to all people who are PRO GMO or corporations that use GMO in their products, if there is nothing wrong with them then PUT IT CLEARLY ON YOUR PACKAGING, on your website… let people know that your products contains GMO’s and LET PEOPLE CHOOSE what goes into their body. I am and always have been fairly particular about what I eat. You would be surprised at how many products contain GMO’s, even products in the “natural food/organic” sections in grocery stores have GMO’s! Check out KASHI’s website… I admire that they are willing to post openly on their website that they use GMO’s in all but 11 of their products but are trying to works towards using less and less GMO’s. Thank you Kashi for at least giving people the right to know what they are eating with your products. I am super careful to purchase only organic or non-gmo products (when I can) and if I am unsure, I e-mail the company and ask… I encourage everyone to do the same… I hope it will help raise awareness and let companys know that this is important to people. If you want to eat GMO’s, have at it. It is my right and I choose not to. Very sad that congress passed a bill protecting Monsanto from future consequences related to GMO’s. Hopefully people will wake up one day. People who are confused are forgetting Big Agriculture is also trying to increase corn like crazy to waste as a fuel. That’s why our food is so overpriced, and why we are facing all these nasties. Monsanto needs control, but the Administration has adopted them. Lucky Americans! Don’t think government will protect us in this GMO battle. It really comes down to the consumer; we as consumers put up with this garbage to realize lower (food/fuel) pricing. Lower pricing of our food enables us to afford our beloved electronics; cell phones, IPads, Laptops, TV, etc. Our health is failing, and allergies seem to be climbing. We need to get a clue, and to go back to food basics. Unfortunately organic foods are hard to find and so expensive these days. It is so shocking to see how many of our favorite foods contain GMO properties. Our priorities are wrong in America. The article didn’t mention Monsanto suing farmers for patent infringement when the GMO corn crosses with non GMO corn. Also you can plant two fields of corn one GMO and one not,animals such as deer,racoons,crows will not eat the GMO field. But will eat the other corn. I have seen this myself. Monsanto’s GMO process first began in Vietnam, when they produced the murderous chemical Agent Orange to kill the vietnamese population. After the war, ther was no way to make money selling their product as a weapon of death, but luckily they noticed that one of the side effects of Agent Orange was that the habitants and the vegetation of Vietnam was growing freakishly large before developing cancer and dying a painful death. They saw how this could be marketed toward the food industries. The last time I went into a night club, I was shocked, as a 25 year old, solid 5’10” tall man who went from raw foods (only live vegetation) as a teen to an organic vegan as an adult, how incredibly tall the new generation was… and how incredibly unhappy they looked on a physical level. People would stop and stare at me, I can only assume it was because of my vibrancy. I am a graduate of the University at Asheville, arguably the leading school for health and wellness in the world. So I am fairly knowledgeable regarding gmos. However, I can’t seem to find a consensus as to if oats have become gmo. I was under the impression that canola, soy, sugar beets, corn, cotton, Hawaiian papaya, and some zucchini are ge, but that’s it. There are some “accidents” like the ge wheat fields found, so are assuming that there is contamination in oats, or has it been proven? Great. Let’s make this about vaccines now. Wait..where’s Jenny…. That’s for the article, I was in a meeting and they had Smartfood Popcorn, which I love, and as I went to stuff my face I began to think…hmmm fritolay, they were sued for calling GMO products natural, best look this up on the interwebs. Now, I’m here, thank you!